This recipe really needs no explanation. Found it, followed it, loved it. Why try to change a good thing. 1. In a large mixing bowl, cream together the butter, cream cheese, and sugar until smooth, light, and fluffy. Add the vanilla extract and ground cinnamon and mix until well combined. Gradually add the flour to the creamed mixture and mix well. Divide the dough into four portions; cover and refrigerate until the dough is firm and easy to handle. 2. Preheat the oven to 350 degrees Fahrenheit. Remove one portion of dough from the refrigerator. On a floured surface, roll out one portion of dough until it is about 1/4-inch thick. 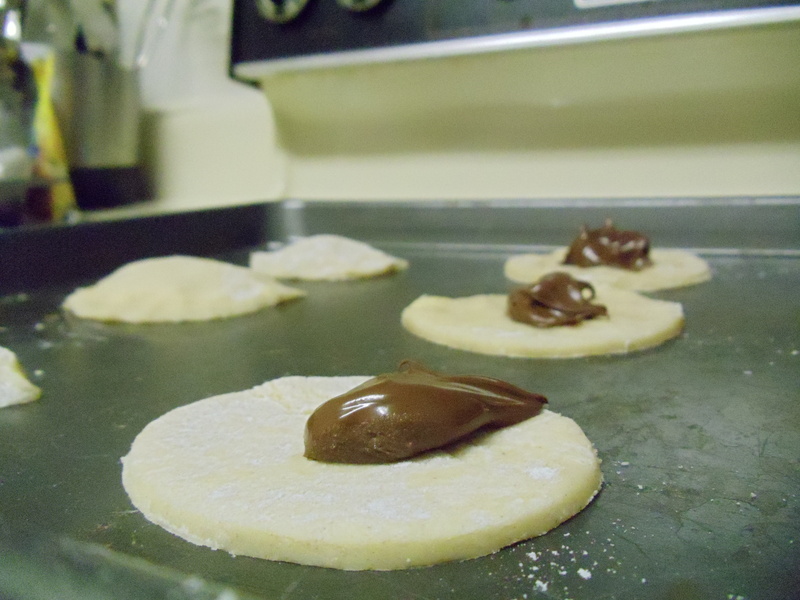 Using a circle cookie cutter (or biscuit cutter) that is approximately 3 inches in diameter, cut circles out of the dough and place them on an ungreased cookie sheet. 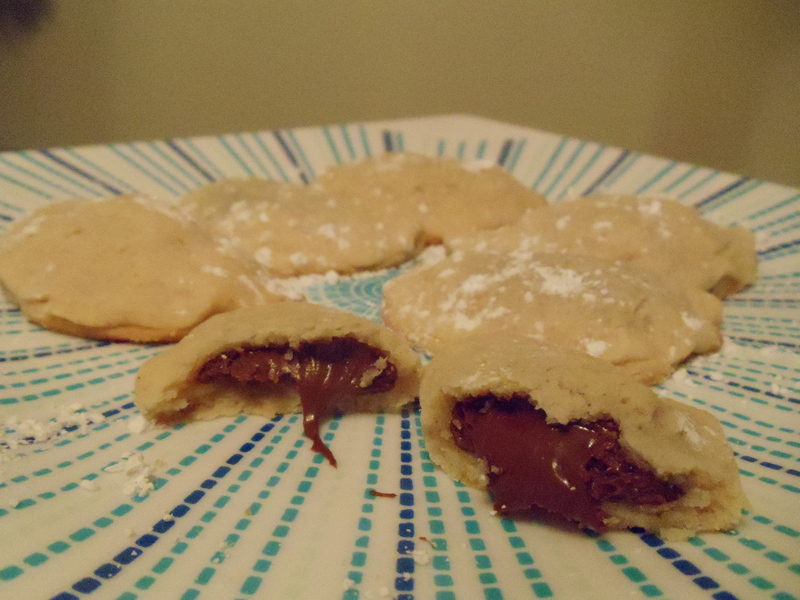 Place approximately 1 1/2 teaspoons of Nutella on each circle, slightly off-center, then fold each circle in half so that the edges meet and lightly press the edges to seal. Repeat this process for each portion of dough. 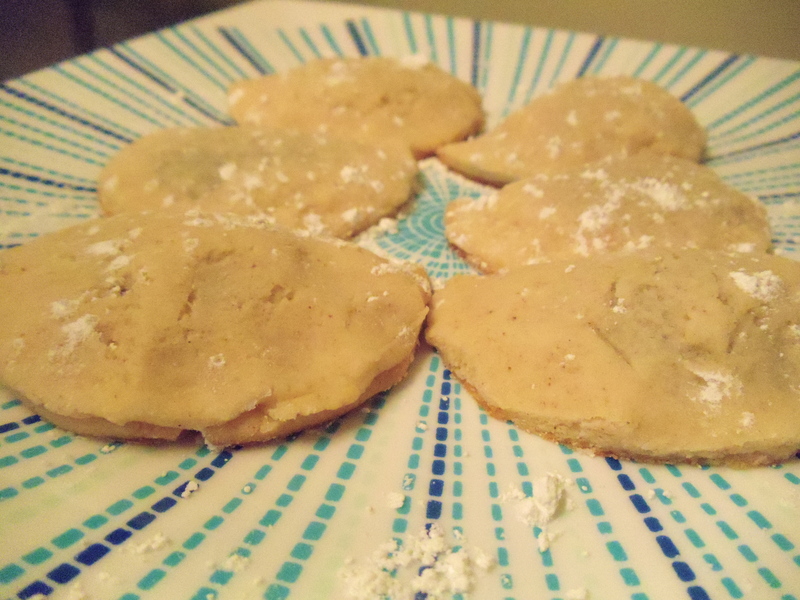 3.Bake the cookies for 12 – 15 minutes or until the edges are lightly browned. Leave the cookies on the cookie sheet for 2 – 3 minutes before removing them to wire racks to cool. All the cookie tasters agree that these cookies are trouble!